Perfect for a small collection, the Amish Small Sliding Door Console Curio Cabinet makes a lovely display in your living room, dining room, hallway or foyer. 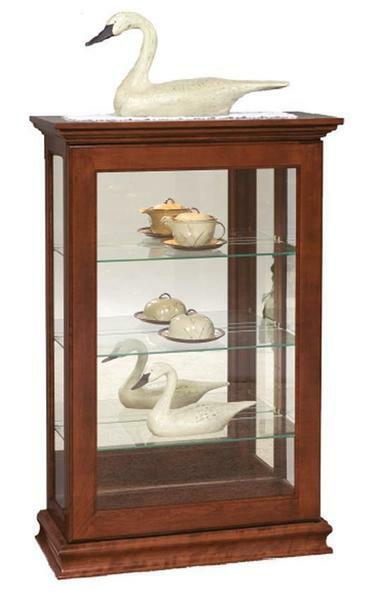 Showcased in the solid wood you select, this glass curio cabinet offers loved ones a glimpse at items that you hold dear. Share the stories attached to the items you've saved and enjoy what they represent. This Sliding Door Console Curio Cabinet offers a lovely display case complete with a mirror back, adjustable glass shelves with plate grooves and touch lighting to enhance your display. The sliding glass door offers easy access to this Amish cabinet, allowing you to add and arrange items with ease. Explore our collection of Amish Curio Display Case Cabinets to find the one that best reflects your personal style. Review our blog post, Curio Cabinet of Curiosities for information on curio cabinet styles and features. Amish made furniture offers you options to create a curio cabinet that serves you best. Select your favorite wood and stain and consider beveled glass for your cabinet. Add up to two additional shelves to hold more items if you wish. Call an Amish Furniture Specialist today, toll-free at 866-272-6773 with any questions about this Amish curio cabinet.